We all know that the life of the programmers is usually short unless they keep digging what’s new on the internet. If you are a programmer, you must maintain the focus on few essential programming languages that are not going to die yet. There are different programming languages that you should be focusing on so you can have a good career in the programming field. 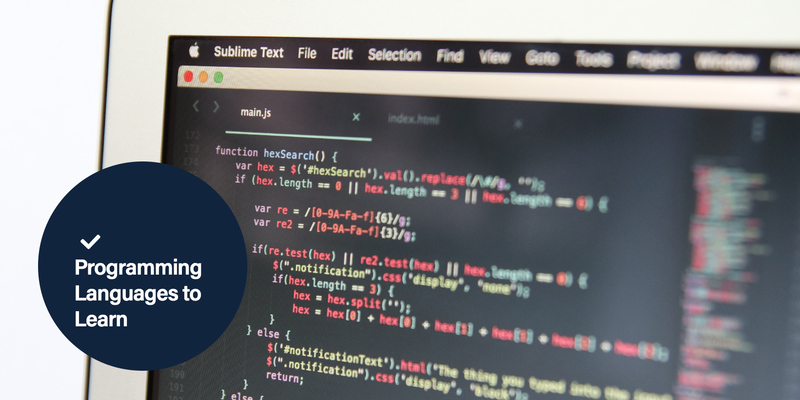 If you are a web developer, then there are multiple programming languages that you need to learn simultaneously to keep things better for your future. If you want to get to the program, then you will have to start with few basic structural level programming languages that will help you create complex structures. If you are working in WordPress, then you must focus on learning PHP so you can create awesome WordPress themes. Multiple other languages run side by side when you are doing web development. We will be sharing few relevant programming languages that you should be learning in 2017 if you want a career as a programmer and earn a good salary. Let’s check out the programming languages that you need to focus. PHP is one of the most important and shared programming languages for all those developers who are developing e-commerce websites. Moreover, if you are working in WordPress, then PHP is the programming language that you should be good. Most of the web development platforms are using PHP including multiple content management systems. PHP is also one of the most comfortable programming languages to learn, and it can be used as functional oriented and object-oriented. If you are a beginner to PHP, then you should know that it will take some time for you to adjust yourself to the coding style of this programming language. There is no doubt that the Java is not going to die anytime soon as it can be the best tool if you are developing e-commerce sites. In website development, Java has much importance, and you should put it on the top of your list of the programming languages of 2017 if you are working as a web developer. Moreover, it is easy to learn and provide with all the tools that the developer is looking. Java is also an object-oriented and class-based programming language. If you are looking to develop a stunning e-commerce website, then it can serve as the versatile programming language. If you are working with the iOS operating system, then you must address learning Objective-C and Apple’s Swift programming language. There is an increase in the demand as compared to the previous year, and Apple is also planning to release Swift 4 in 2017. Swift, launched in 2014, and it got an increase in the popularity due to ease of use and speed. If you are working on iOS, then you must consider learning iOS programming languages so you can get the maximum jobs posted online for iOS development. Python is still maintaining its popularity, and it is still a programming language that you should be learning in 2017. Python is the third most popular programming languages out there. There are multiple job postings for Python programmers on the internet. If you are developing desktop apps, and web apps, then you must consider learning Python. Due to its ease of use and code readability, it is one of the most critical programming languages out there. Python is still a trending programming language in 2017, and if you are working with the applications, then you must consider learning this programming language in 2017. SQL is the programming language with the most number of jobs on the internet. Structured Query Language is common and widespread programming languages that you should learn in 2017. If you are working in the IT and computer sciences field, then you must be aware of the SQL as it is the most commonly used language for databases. Moreover, the programming language also has multiple variations like MySQL and Microsoft SQL. In 2017, there are still many jobs for the SQL programmers, and the number of employees is increasing as compared to the previous years. You cannot move further if you do not have a good understanding of the HTML. If you cannot create structures with HTML, then you cannot move to the other languages and understand the complete story. HTML is one of the primary programming languages that every programmer should learn. If you do not want to learn HTML, then you must have a complete understanding of how it works properly and how you can use this particular language combined with others. Whatever programming tool you are using, you will have to deal with the HTML. For creating the base of the pages, and websites, you will have to take help from the HTML. There are countless jobs available on the internet for the CSS language. It is a markup language, and with the support of this particular programming language, you will be able to create attractive web pages, and websites. HTML allows you to create the structure of your pages. However, when you are making your web pages visually appealing, you will have to take help from the CSS to complete the websites. Every programmer who is looking to create stunning sites and landing pages should be learning CSS in 2017 as it has become of the most common programming languages out there.